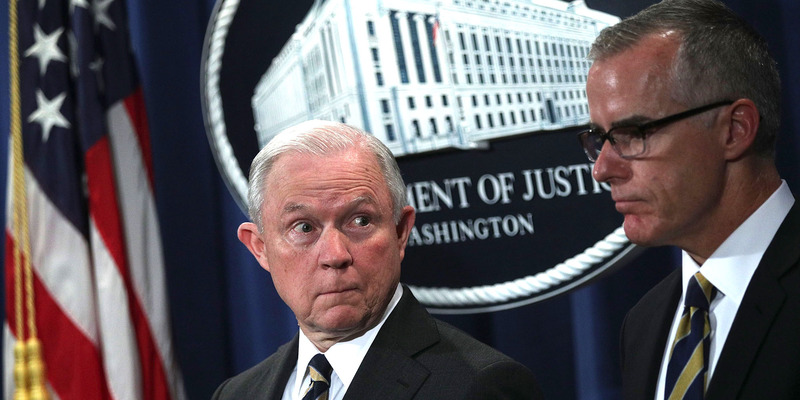 Alex Wong/Getty ImagesAttorney General Jeff Sessions and then-Acting FBI Director Andrew McCabe attend a news conference on July 13, 2017. Former FBI deputy director Andrew McCabe is reportedly meeting with senior DOJ officials to ask them not to fire him three days before he’s set to retire. McCabe was forced out of the bureau earlier this year amid an internal investigation into his handling of the Hillary Clinton email probe. Attorney General Jeff Sessions is reportedly weighing whether or not to fire McCabe – a decision that could come as soon as Friday. McCabe’s potential firing could also imperil his pension benefits and jeopardize his financial future. Former FBI deputy director Andrew McCabe will make a final appeal to the Department of Justice on Thursday, begging them not to fire him days before he’s set to retire, The Washington Post reported. McCabe was forced out of the FBI earlier this year amid an internal investigation by the Office of Inspector General into his approval of unauthorised disclosures to the media in October 2016 about the bureau’s Hillary Clinton email probe. He’s scheduled to retire on Sunday, and a possible firing – which sources told The New York Times could could as soon as Friday – could endanger his pension benefits. The Department of Justice’s inspector general Michael Horowitz reportedly concluded in a report that McCabe was not forthcoming during the OIG review. The FBI office subsequently recommended that Attorney General Jeff Sessions fire McCabe, according to The Times. McCabe is not meeting with Sessions, who is travelling on Thursday, but with senior officials, including Scott Schools, the top career attorney at the DOJ, according to the Post. The article was a highly detailed account of internal strife within the top ranks of the DOJ about how to proceed after FBI agents investigating former New York congressman Anthony Weiner discovered 650,000 emails on his laptop that could have been sent to or from Clinton’s private email server. While law-enforcement officials often speak to the press on background in order to provide more complete details about an ongoing story, they are prohibited from revealing information about ongoing investigations, like the Clinton email probe. McCabe stepped down as deputy director in January after FBI director Christopher Wray briefed him on the impending OIG report about his conduct. He started his career at the FBI New York field office in 1996, and spent 22 years at the bureau, working his way up to acting director.